Latest: January 2016: Getting close! Roof & insulation is almost done. September 2014: Windows in and stucco well on the way. 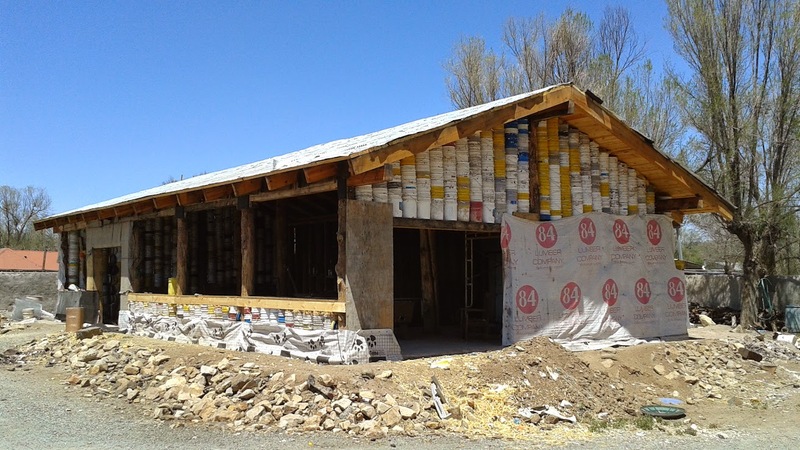 May 2014: The bucket house really starting to look like a house. There's obviously a lot of work left but the bucket walls are up and locked in place, ready for stucco and finishing. Here are the latest photos. 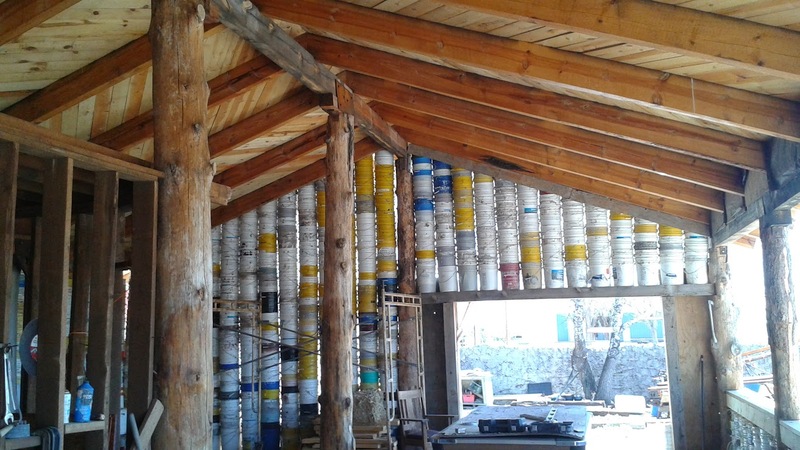 June 2013: Now that the bucket wall has all but its final color-coat of stucco it's time for a new bucket project - a bucket house! (The final stucco coat will happen when the house is finished so that the existing house, new house addition, and wall all look the same). I've added a new page (see the link of the bottom-left) so you can follow its progress. The bucket house will be a timber-framed house with the same 5 gallon bucket stacks filling the space between the timber posts. Check out the Bucket House page for more info. Sept, 2013: All the buckets are now covered! Check out the latest photos. All of the buckets are now in place and we now know that the wall used 20,000 buckets. Lincoln County hauls it's waste some distance to a landfill and the buckets in this wall would have filled 5 semi trucks. This saved $5000 in transportation costs (which would have been paid for by the taxpayer) and $2,500 in landfill costs (also paid by the taxpayer). The whole project will cost $10,000 when complete (mostly in stucco costs); that's for a 600 foot wall 6 to 8 feet high!